Bring the family along to Hempstead Valley this month and enjoy some free half term fun with the kmfm Street Team! From Monday, February 18 until Sunday, February 24 between 11am and 3pm the Gillingham shopping centre is providing a range of free activities to keep kids occupied. There will be art and craft workshops where youngsters can get creative and colour in their own designs, together with make and take greeting cards and paper flowers. There will also be free face painting provided by a professional facepainter. Su Button, marketing manager said, “With Hempstead Valley being at the heart of the local community for over 40 years, we recognise that there is a real demand and appreciation for good quality free activities. Children love getting creative and for seven days during half term we will be offering free, fun activities in conjunction with the kmfm Street Team." Please click here for our house rules. One mum's tales of the unexpected. Read more here. Scour The World Garden for Easter clues. 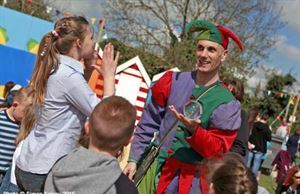 The English Festival is a fun-packed day out for the whole family celebrating the most iconic and ironic of English traditions. 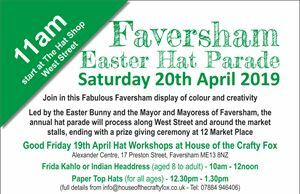 Join in this Fabulous Faversham display of colour and creativity Led by the Easter Bunny and the Mayor and Mayoress of Faversham. An Easter party with all the feel of a festival is happening in Kent this weekend - and it's free to enter! A huge inflatable water park has opened just in time for Easter and the weather forecast is looking warm and sunny! Didn't get your chosen primary place? Play 'Say It' with Garry and Laura on kmfm Breakfast and you could win £1,000!